Provocative palate pleasers for a prudent pocketbook. It's not a load of crock! Your slow cooker loves you. And you'll love this soup! Last night I had to work late and knew this ahead of time so I figured it was a good night to use our slow cooker. I happen to love using our crock pot and it makes me happy to see that so many other people are now loving theirs again by welcoming it back onto their kitchen counters with open arms. But if I need to try and validate to you why I love it so… well, it reads like a cheap romance novel. Reason for crock pot love number 1: It cooks for me even when I don’t treat it well. When it’s not ever so sweetly being used by me, I am usually shoving it into the dark recesses of my kitchen cupboards. Reason number 2: It’s a cheap date. I have never given it more than $5-$10 at any one time and it puts out enough for the two of us… for sometimes several days. Tell me who you can take out for that cheap and treat with such disrespect and force to do almost all the work in the relationship and you reap all the benefits? Yeah, my guess it’s the other way around. I had a couple of odd veggies still hanging around and some bacon that I was hoping to get used up this week. 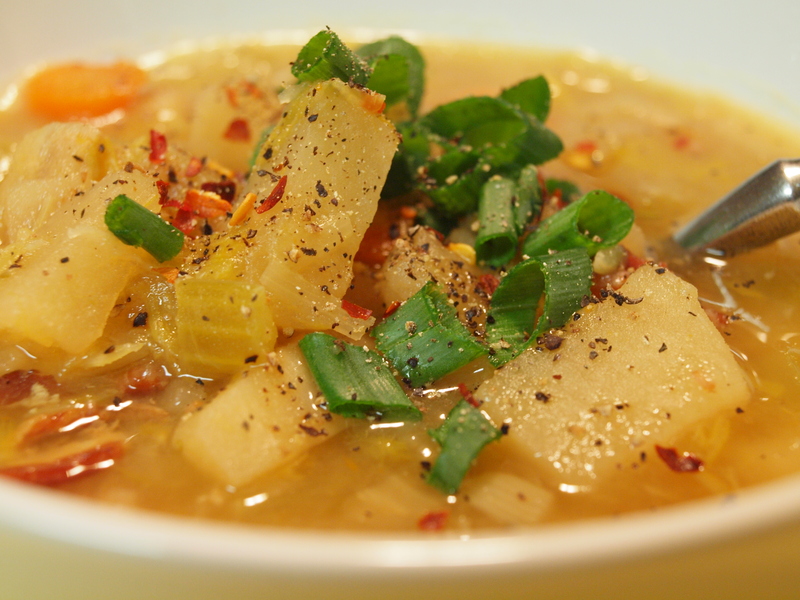 So with my meat and two veg (sorry, I can’t help myself), me and my crock pot made us some homemade potato leek soup. The soup turned out super (or rather, souper) yummy even though I decided to not add any cream, butter or milk to it. I had it in mind to keep it a little healthier while still being a comforting winter meal, so I made it a broth based soup. Also, did you notice that it is gluten and dairy free? You’re welcome. Just make sure that the broth base you use is such and everything will be okay. You could even make it vegetarian by leaving out the swine and using vegetable broth. And speaking of broth… Likely if you don’t have any homemade stock lying around, you probably have to go to the cartons or cans, right? 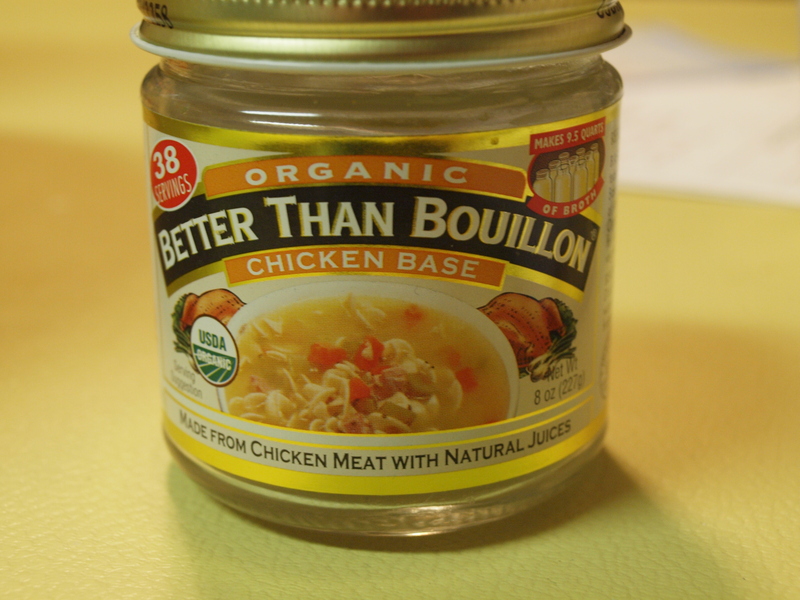 Well I have been using this super convenient and very affordable alternative to canned broth called Better than Bouillon. It is organic and free of MSG and according to my research on surefoodsliving.com is gluten free (but not dairy, corn or soy free). A jar costs under $5 and makes up to 38 8-ounce servings with it… that’s roughly 19 cans of broth which at about $1/can can get rather pricey. All you have to do is scoop out a teaspoon and add it to 8 oz. water. Yep, it’s that easy! This is a picture of what the label on the jar looks like so you you can find it for yourself. Below are the ingredients I prepped and put into the slow cooker and then I did something unimaginable… I plugged it in and turned the notch to ‘low’ and left it to occupy itself for about 7 hours. Yep that was it! You really don’t need to measure any of this out, just start dumping things in the crock pot. It doesn’t mind… it can take a beating. Prep all ingredients, throw into crockpot, stir. Put lid on. PLUG CROCK POT IN and cook on low for 6-8 hours, or on high for 4-6 hours. Enjoy! Garnish with sliced green onion, fresh cracked pepper and if you’re like me some red chili flakes. I look forward to hearing your comments on how it turned out for you! Posted in Affordable Eats, Dairy Free, Gluten Free, Palate Pleasers, Slow Cooker, Soup, Weeknight Dinners and tagged $5-$10, affordable cooking, affordable food, bachelor, bachelor cooking, bacon, bay leaves, best potato leek soup recipe, better than bouillon, better than bouillon chicken base, Bouillon, broth, carrot, celery, cheap date, cheap soup recipe, chicken broth, chicken broth alternative, chicken broth substitute, comfort food, cook, cooked bacon, cooks for me, cream, crock pot, crock pot love, crock pot recipe, crock pot soup recipe, dairy free meal, dairy free recipe, dairy free soup, disrespect, easy crock pot recipe, easy potato leek soup, easy slow cooker recipe, easy soup recipe, fast prep recipes, fresh cracked pepper, garlic, gluten and dairy free meals, gluten free diet, gluten free recipe, gluten free soup, green onion, healthy eating, healthy meals, healthy recipes, Home, home cooked soup, home cooking, homemade soup, homemade stock, kosher salt, lazy cooking, leeks, load of crock, love me some, meat and two veg, MSG, no butter, no cream, no dairy, no gluten, no milk, nutmeg, onion, organic, palate pleaser, potato leek soup, potatoes, provocative, put out, reap benefits, red chili flakes, relationship, romance novel, rosemary, russet potatoes, slow cooked, Slow cooker, slow cooker potato leek soup, slow cooker recipe, slow cooker soup recipe, slow cookin', Soup, soup recipe, souper soup, Soups and Stews, surefoodsliving.com, swine, under 10 dollar soup, vegetable broth, vegetarian cooking, vegetarian crock pot recipe, vegetarian slow cooker recipe, vegetarian soup, vegetarian soup recipe, wednesday, weekday cooking, winter meal, work late. Bookmark the permalink.